Fresh rumors suggest Apple is readying production of a new iPhone X color option to boost sales of the flagship smartphone, while an anticipated revamp of the company's low-tier 9.7-inch iPad is said to arrive in the third quarter. Citing sources familiar with the matter, Japanese language blog Mac Otakara reports Apple is mulling the introduction of a new gold iPhone X color to reinvigorate sales amid seasonal declines. Rumors last week point to blush gold. Parts leaker Benjamin Geskin showed off the supposedly new hue in what looks to be mockup hardware including an iPhone X chassis and SIM card tray. The components' authenticity cannot be verified, and Geskin made identical claims in the lead-up to last year's iPhone X launch. 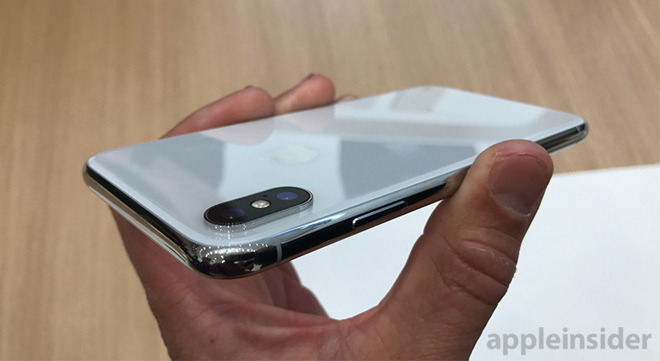 Currently, Apple offers iPhone X in Space Gray and silver finishes. The company has in the past used identical strategies to boost product shipments. Just last year, a special edition (Product)Red iPhone 7 was released at the end of March to join existing black, Jet Black, silver, gold and rose gold options. As for Apple's low-cost 9.7-inch iPad refresh, the publication's sources said a revamped sixth-generation tablet is expected to ship sometime in the third quarter. The rumblings come on the heels of a Bloomberg report which last week predicted Apple to launch a new version of its low-cost 9.7-inch iPad model at a special event in Chicago. Aimed at the education market, the updated iPad is rumored to boast an upgraded processor and perhaps Apple Pencil support. Whether the rumored sixth-generation iPad and the education-focused model are one in the same is at this point unknown. When the fifth-generation iPad debuted last year, Apple passed on the usual launch event fanfare to announce the device in a standard press release. The company will do much the same with this year's refresh, according to the report. Update: Mac Otakara subsequently added details on a gold iPhone X variant. This report has been updated to reflect the new information.